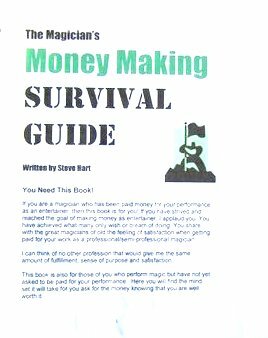 The Magician's Money Making Survival Guide | Articles, tips, ideas and an e-book on how to make money as a professional magician. Articles, tips, ideas and an e-book on how to make money as a professional magician. What does a Magician do when he needs to make some fast cash to pay the bills? Are you struggling? Want to get out of the “Survival Mode” and onto making good money as a magician? Read what other magicians do when they need to make money FAST! This e-book will give you valuable insight and action steps toward making easy money as a professional magician. Over 60 pages of first hand experiences…covering over a dozen ideas for making money. My guarantee is that you will get at least one idea worth the price of this e-book or I will refund your money in full. On my BLOG you get Free articles, tips and topics on creating Motivational Magic! Here is the link to my BLOG: magic2motivate CLICK HERE!